The U.S. has the fourth highest estate or inheritance tax rate in the OECD at 40 percent; the world’s highest rate, 55 percent, is in Japan, followed by South Korea (50 percent) and France (45 percent). Fifteen OECD countries levy no taxes on property passed to lineal heirs. The U.S. estate tax has a high rate and a large exemption; as a result, it raises very little revenue and applies to very few households. U.S. estate tax receipts have declined precipitously over the last fifteen years, from $38 billion (2015 dollars) in 2001 to an estimated $20 billion in 2015. As estate taxes become narrow-based, meager revenue sources with high administrative costs, repeal becomes a strong option. Thirteen countries or jurisdictions have repealed their estate or inheritance taxes since 2000. Repeal of the U.S. estate tax would gradually increase the U.S. capital stock by 2.2 percent, boost GDP, create 139,000 jobs, and eventually increase federal revenue. The United States is one of many countries that levies taxes on estates or inheritances. This report compares this aspect of the U.S. tax system to other countries around the world and examines recent worldwide trends in estate and inheritance taxes. Estate and inheritance taxes are poor economic policy. They fall almost exclusively on the domestic capital stock—the accumulated wealth that makes America richer and more productive as a whole. Taxes levied on the capital stock restrict job growth and harm the economy. This study finds that repealing the U.S. estate tax would lead to the creation of nearly 150,000 jobs and would eventually increase federal tax receipts by $8 billion per year. Most countries that levy estate or inheritance taxes do so with lower top rates than the rate in the U.S. The U.S. under current law has a high top rate and a large exemption. As a result, its estate tax, despite the high rate, raises very little revenue. Many countries have recognized that estate and inheritance taxes are a poor source of revenue and eliminated these taxes altogether. Given low revenue collections, high compliance costs, and a narrow base, the U.S. should seriously consider following suit. A survey of top estate and inheritance tax rates among the Organization for Economic Cooperation and Development (OECD) countries shows that the U.S. has a very high top marginal rate on estates by worldwide standards. At the margin, an estate passed to a lineal heir is currently taxed at a rate of forty cents on the dollar, putting it at fourth overall, tied with the United Kingdom. The highest top estate tax rate to lineal heirs can be found in Japan, at 55 percent. South Korea (50 percent) and France (45 percent) also have rates higher than the U.S. At the low end, fifteen of the thirty-four countries in the OECD have no taxes on property passed to lineal heirs. The average estate tax rate across the OECD is 15 percent with a median tax rate of 7 percent. Many countries with estate or inheritance taxes have exemptions. This achieves two aims. First, exemptions are a simple way to make taxes more progressive. Second, these particular taxes have high compliance and enforcement costs. Assessing the value of people’s assets is difficult, and it is not a worthwhile pursuit if those assets are not particularly valuable. The U.S. estate tax has an exemption of $5,430,000 in 2015. This is considerably larger than the exemptions in France ($105,945), Germany ($423,782), Japan ($247,297), and the UK ($488,280). The U.S. exemption has grown substantially in the last fifteen years. The peculiar path of the exemption—including the year of full repeal—comes from the Economic Growth and Tax Relief Reconciliation Act of 2001, which was scheduled to sunset at the end of 2010. 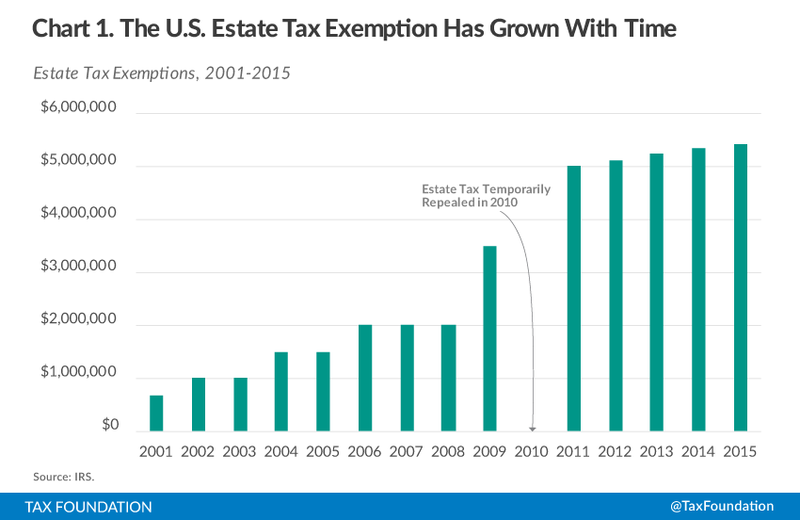 A subsequent bill, the Tax Relief, Unemployment Insurance Reauthorization, and Job Creation Act of 2010, reinstated the estate tax but with a higher exemption than before. Finally, the current law structure was put into place by the American Taxpayer Relief Act of 2012, also known as the “fiscal cliff” deal. Exemptions tend to have a substantial impact on revenues. 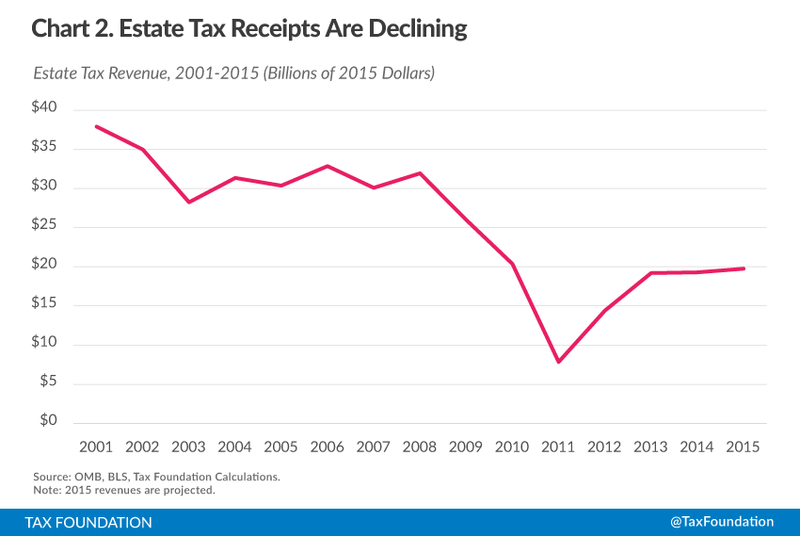 Revenues from the estate tax have declined precipitously as the exemption has increased, lowering the number of estates required to pay. A Tax Policy Center simulation from 2013 estimated that less than 4,000 estates would trigger an estate tax liability that year. While a relatively small number of estates pay the tax each year, many more have to plan for the tax. Privately-owned businesses of all sizes spend money on this expensive endeavor. In total, current revenues from the estate tax are barely half of what they were in real terms at the start of the millennium. The tax raised almost $38 billion (2015 dollars) in 2001, and it will raise only $20 billion in 2015, according to the most recent estimates from the Office of Management and Budget. This is less than 1 percent of annual federal revenue. As exemptions and tax planning strategies chip away at the tax and narrow its base, the tax becomes less and less worthwhile as a source of revenue. As the United States maintains one of the highest estate taxes in the world, many countries are increasingly moving to eliminate this tax. 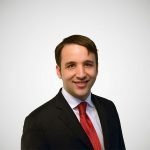 As revenue dwindles, the fiscal benefits of the tax to the government are eventually outweighed by the administrative, political, and economic costs of levying a tax on a narrow base, and repeal becomes a more and more viable option. Eleven countries and two tax jurisdictions have repealed their estate or inheritance taxes since the year 2000. The two tax jurisdictions to repeal were Macau and Hong Kong, which brought them in line with the rest of mainland China. Also notable for eliminating their inheritance and estate taxes were Norway and Sweden, countries usually known for progressive politics. For example, the Social Democratic Workers’ Party of Sweden repealed the tax in 2005. Their example reveals something important about estate tax repeal: interest can be independent of ideology. Even governments that like high revenues for robust social welfare spending find that estate or inheritance taxes are not an effective source. The experiences of these countries have been largely positive. In 2013, IKEA founder Ingvar Kamprad returned to his home country of Sweden after forty years of living abroad for tax reasons. Repealing the estate tax in the United States would increase investment, add jobs, and expand the economy. The estate tax has a narrow base and a high rate, and it falls almost exclusively on the domestic capital stock. The capital stock (accumulated wealth) makes America more prosperous and productive as a whole, so taxes levied on the capital stock have unusually poor effects on economic growth. Under the Tax Foundation Taxes and Growth Model, a simulated elimination of the estate tax results in approximately 150,000 additional jobs and 0.08 percent additional annual GDP growth in the decade after elimination. The static revenue loss of $20 billion per year would gradually be recouped through higher levels of wealth accumulation, and therefore, higher receipts from individual income taxes, payroll taxes, and corporate income taxes. In the long-run, the repeal would result in higher annual federal revenue of $8 billion due to the increased economic growth. In addition to the weak revenue numbers, the estate tax creates a cottage industry of tax planning, where skilled lawyers and accountants—people who could be more gainfully employed in the productive economy—instead devote energy to lowering the assessed value of estates. These losses, unseen and difficult to estimate, could be the greater concern. Of all America’s taxes, the estate tax is perhaps the most contentious. On one hand, there is the compelling and deeply American ideal of equal opportunity. On the other, there is another ideal, no less compelling and no less American: that we ought to give our children better than we ourselves received. These two ideas in civic culture are both seen as unqualified virtues. In truth, though, they are often in conflict with each other, no matter how noble each one seems in isolation. The debate over the estate tax is a manifestation of that conflict. This makes sense in the abstract. However, in practice, the association between estate taxes and equality is not strong. The estate tax is ineffective at equalizing opportunity, just as it is ineffective at its other goals. Its low revenues speak to that ineffectiveness. The estate tax is losing ground around the world, not because moral conundrums have been resolved, but rather because it fails at the basic characteristics of being a tax. Its rate is high, causing a substantial drag on growth. Its base is narrow, making it a poor revenue raiser. And lastly, its base is poorly-defined, creating additional economic losses from tax planning. The ultimate purpose of tax collection is revenue generation. Due to the properties described above, the estate tax fails at effectively achieving that end. Eliminating it is the most serious option for reform. Source: Family Business Coalition and Tax Foundation. Tax is levied at canton level, not federal level. Luxembourg has an estate tax, but lineal heirs are exempt. Hungary levies an inheritance tax, but close relatives including lineal heirs are exempt. Family Business Coalition data. These exemptions are, by statute, denominated in the native currencies of their respective countries. Their values in dollar terms change daily with foreign exchange rates, but by any reasonable measure all of these exemptions are substantially lower than the U.S. exemption. Benjamin Harris, Estate Taxes After ATRA, Tax Notes, February 25, 2013. Office of Management and Budget, Table 2.5, Composition of Other Receipts, http://www.whitehouse.gov/omb/budget/Historicals. Hungary’s inheritance tax was repealed for close relatives, but a general 18% inheritance tax still applies to unrelated heirs. Jens Hansegard, IKEA Founder Ingvar Kamprad to Move Back to Sweden, Wall Street Journal (June 27, 2013), http://www.wsj.com/articles/SB10001424127887324328204578571182799372930. The Tax Foundation Taxes and Growth Model is a neoclassical production function of the U.S. economy. A Harris Interactive poll of U.S. adults rated the estate tax as the least fair federal tax, with a score of 3.9 on a scale of one to five. See Tax Foundation, Poll: Tax Code Complex, Needs Reform; Federal Income Taxes “Too High” (Apr. 9, 2009), https://taxfoundation.org/article/poll-tax-code-complex-needs-reform-federal-incomes-taxes-too-high. Levied at the canton level, not federally.